I made it!!! 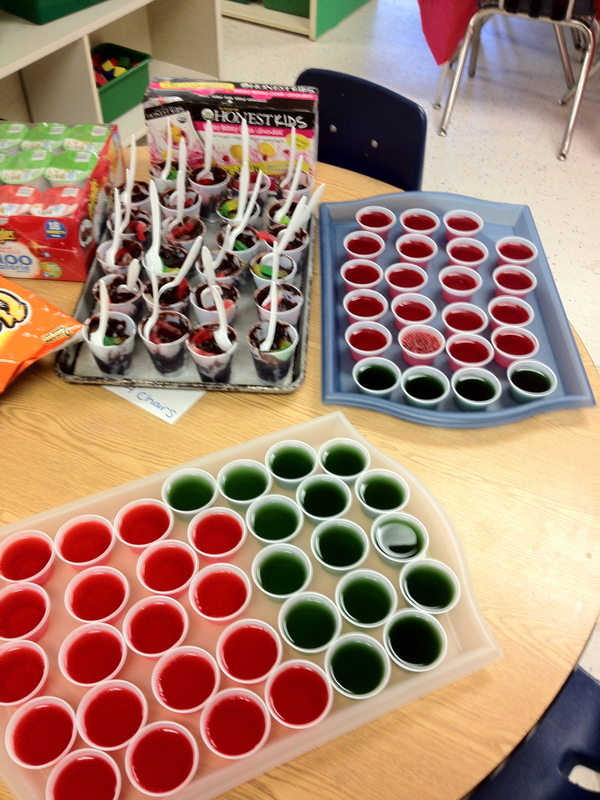 And this time I didn’t cheat once. 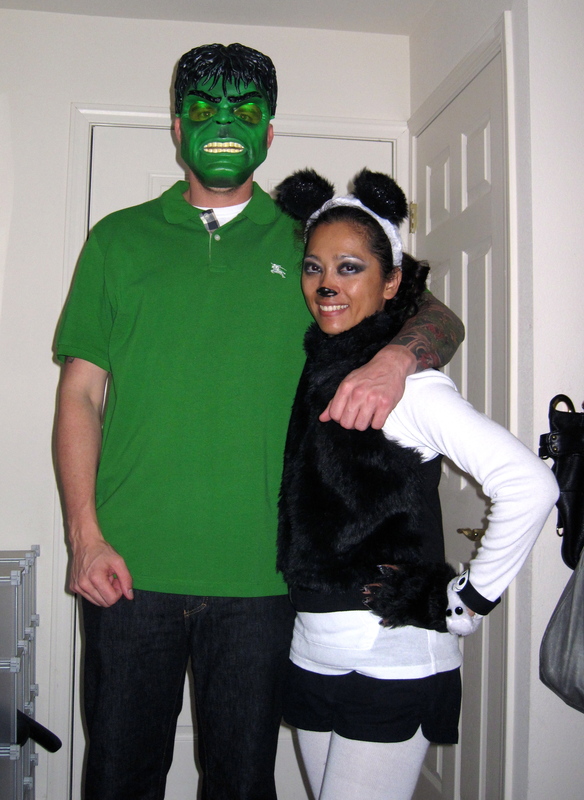 Not even one bite :-) I even survived Halloween and all the sugary craziness around me. That is such a big difference for me. 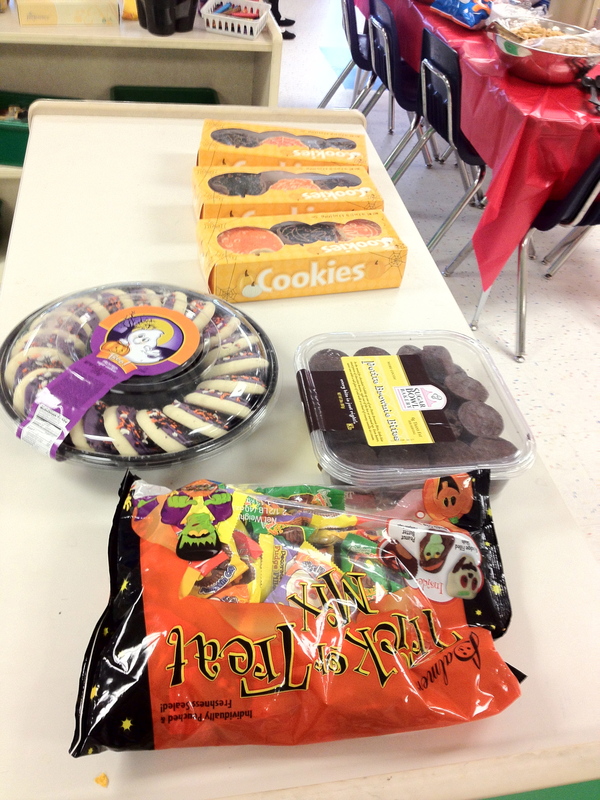 Last year, I would have thought it impossible for me to walk away from sugary sweets at a party and on Halloween. 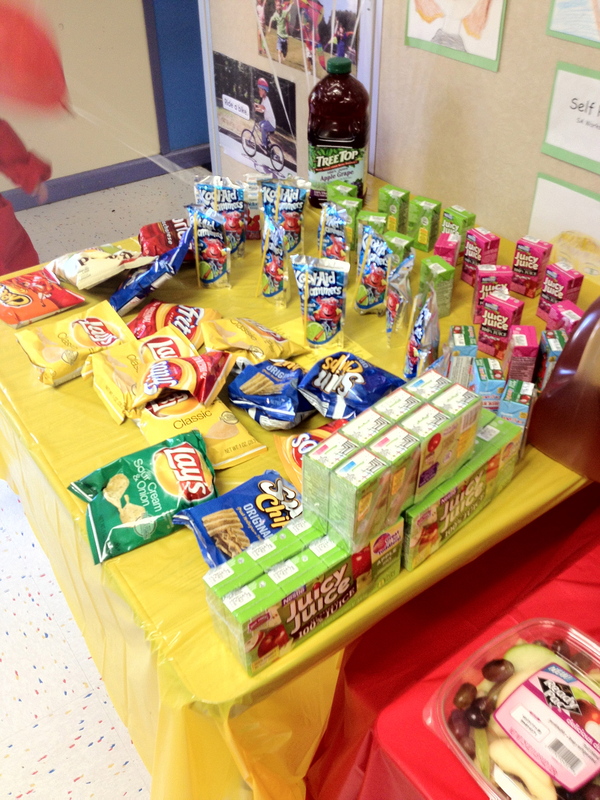 I have had a sweet tooth ALL my life and it has been the hardest challenge for me with my new lifestyle. But now, I know that I can stay away from all that candy. Not saying that I’ll never have another piece ever, but I am happy that I am overcoming my bad habit. That is probably what I am most proud of from the Slim Down. Today was great. I felt great the whole day. Since I was not able to go out for my morning cardio, I popped in P90X CardioX. I really like it because it has so many different moves from yoga to plyometrics. I didn’t feel tired at all. I took the boys to the mall for some last minute Halloween shopping and walked the length of the mall twice. For my second cardio session I went for 3 mile run since Ben was home from work. I had a good run. It was very windy on the way out so it felt like I was in slow motion but I didn’t mind because it kept me cool. 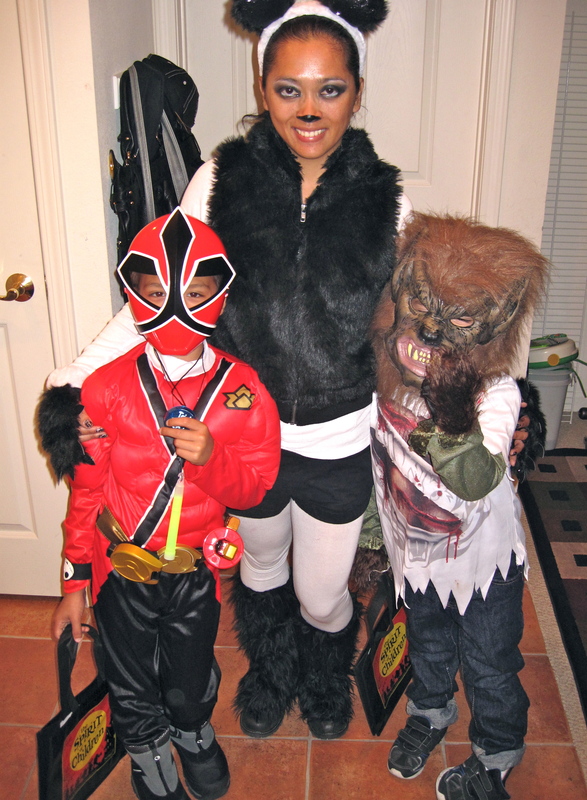 Since it was Halloween, we went trick or treating with the boys. We got through 3 courts and then walked back home. I tripped and pulled something in my right knee so it looks like I’ll be taking a break from running :-( I was going to give my knees a break anyways after the slim down. Meals: Did not feel hungry at all and stuck to the slim down. Subbed steamed snap peas for the asparagus at dinner. Of course I would forget to pick some up when I went to the store this morning, right? lol. 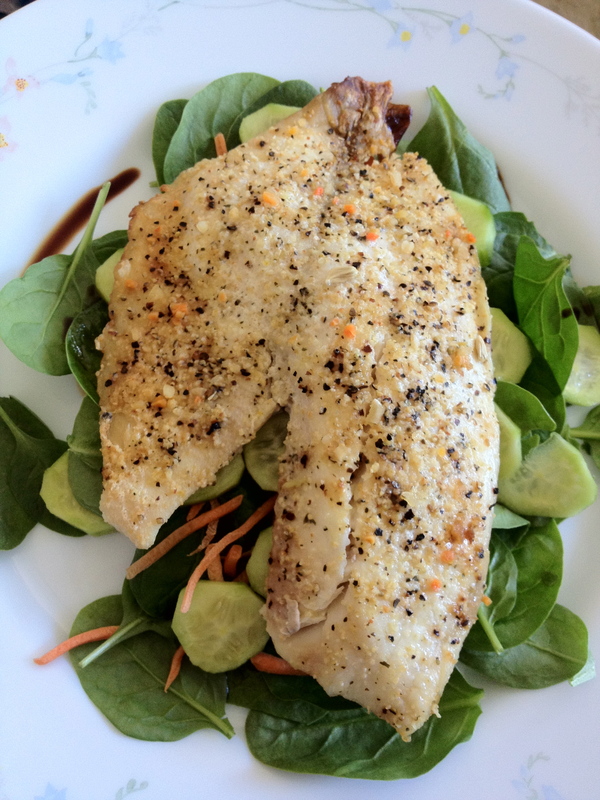 M3: Lean and Green Salad with Spinach, tilapia, carrots, and cucumbers. 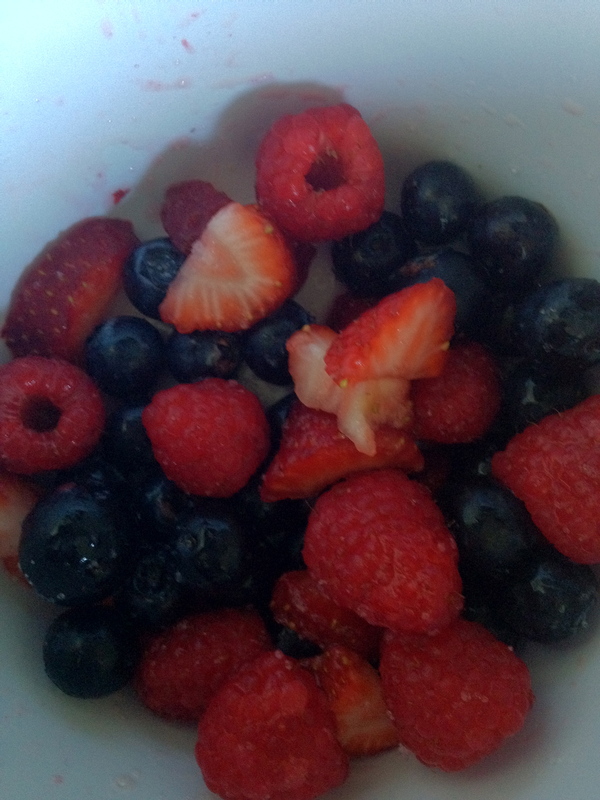 M4; 1/2 cup of berries: blueberries, raspberries, and 2 small strawberries. 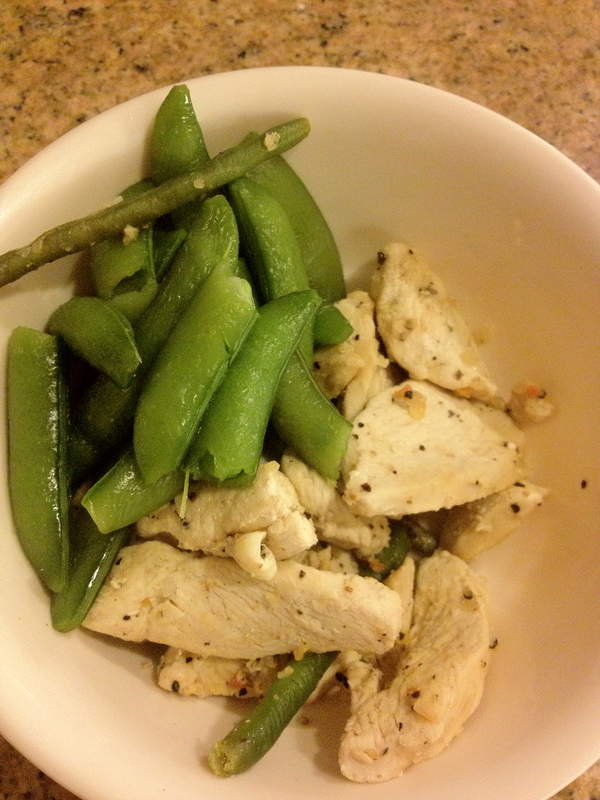 M5: Left over lemon pepper chicken with steamed snap peas. 70 oz. water, 30 oz. of green tea, and a Zico. I will take measurements and weigh myself tomorrow. I am really looking forward to the results. I can tell that I have toned up a bit. I don’t think I have a pair of jeans that fit me anymore. I feel stronger and healthier. There is definitely a difference between the first time I did the Slim Down in August and this time around. I physically could not run every day back then. 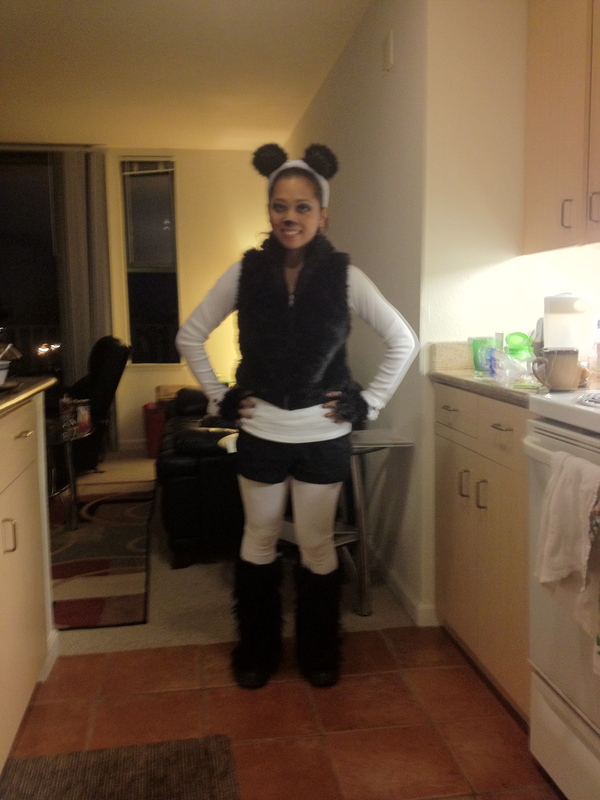 My legs were not strong enough and I would have had shin splints like crazy. I remember taking it easy and not pushing myself because I was worried that I would get hurt. Drinking the required amount of water was such a challenge and I would do little cheats by taking bites of food from my boys. Planning and being organized with my meals and workouts really really helped me stay on track. That is the one advice I would give to anyone who is thinking of doing the Slim Down. This time around, it felt like it went by faster. Most likely because it wasn’t such a chore :-) I am glad that it’s over though. I want to get back to my smoothies and try out some new protein pancakes. I wasn’t hungry, but I did have craving for bread today. It’s really tough when everyone around you is eating food that you can’t have. The boys were snacking on air popped popcorn and it was so hard to Not take some. I really have no idea how I stayed away from the bowl, but I did. Meals: Followed pretty close to the meal plan, except for the asparagus at dinner. Didn’t have any so I had green beans instead. 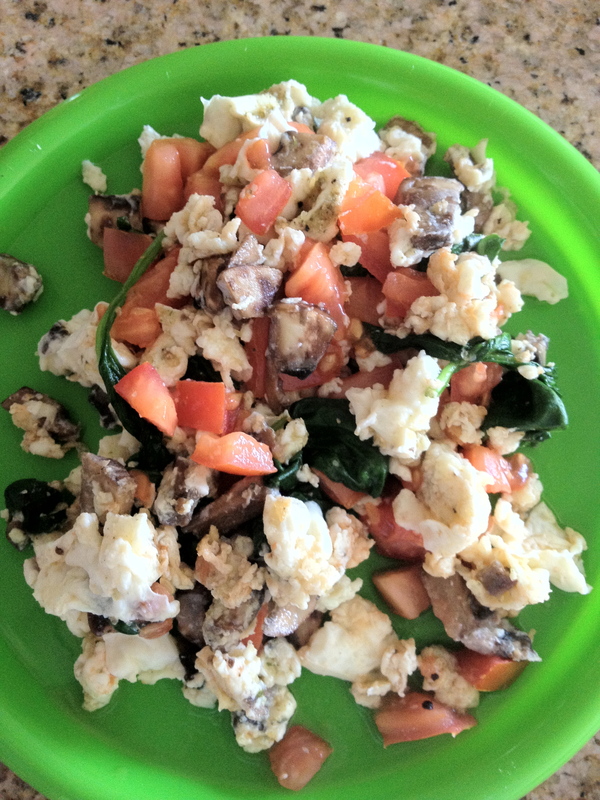 Meal 1: Slim Down Scramble. No Salt and No tomatoes. I don’t like this very much. I like the flavor the tomatoes add. I forgot to take a pic before I ate it. lol. 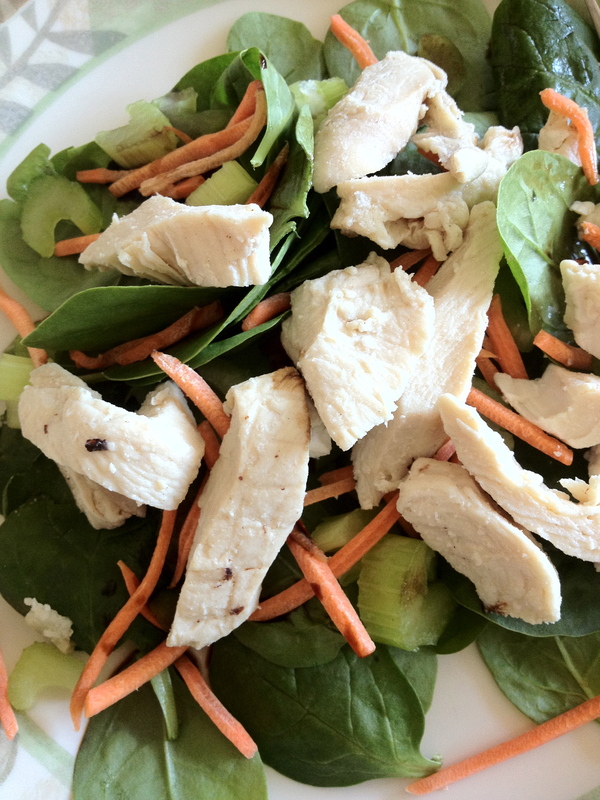 Meal 3: Salad with spinach, chicken, celery, and carrots. Balsamic vinegar dressing. 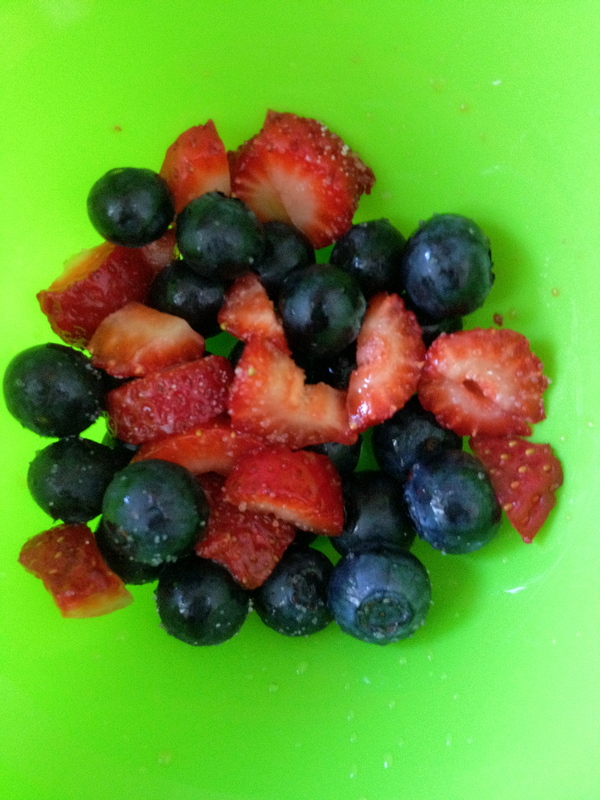 Meal 4: 1/2 cup of berries – used the last of the blueberries I had and 3 small strawberries. Meal 5: Lemon Pepper Chicken seasoned with Mrs. Dash Lemon Pepper and lemon juice with green beans. After Meal 1, Meal 3, and Meal 5 I had a cup of Decaf Green Tea with stevia. I am not a big tea drinker so getting the 30 oz. 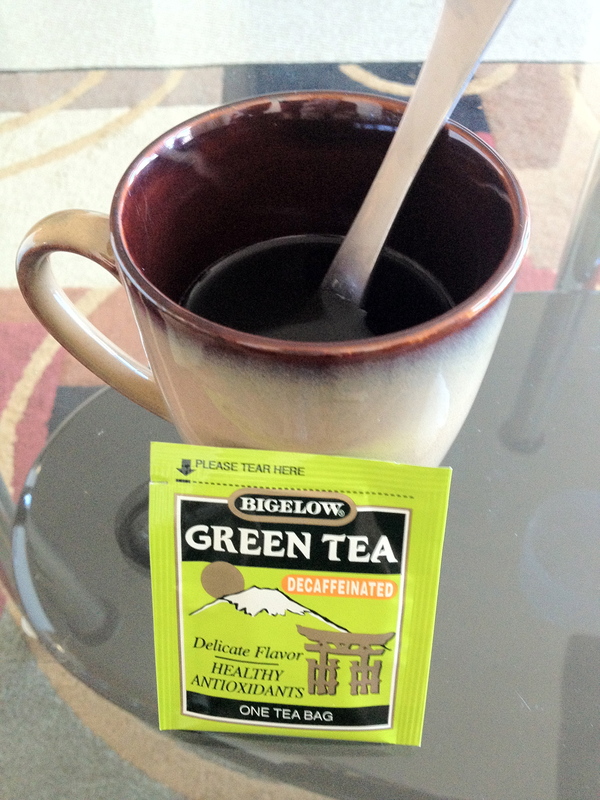 of green tea in is a challenge. I figure if I have it in between my meals, I can get pretty close. I had 70 oz. water and a Zico too. Day 5 was a little tough for me. I felt tired pretty much all day long. After doing my 1 hour bike ride in the morning, I didn’t really want to go and do another workout. I kept hoping to get a chance to take a quick nap but got busy cleaning up the house before my brother and his wife came to visit. I seriously considered using them as an excuse to Not do my afternoon workout. But I didn’t. Instead, I took advantage of having Uncle Ed and Lynee around to watch the boys so I could workout. They took them to the park and I went for a 3 mile run. Since it’s one of my goals to run 3 miles every day, I was really glad they were there because I wouldn’t have been able to do it otherwise. My run actually gave me a boost of energy. I didn’t go fast, but I felt good during my run. The surge of energy helped me get through my total body workout. I did the One Day Fat Blast workout 1. I need to do that one more often because I’m still not strong enough to keep with those girls :-) I was really tired after working out, but I managed to do a few ab workouts to end my day. 15 leg lifts, 15 side plank crunches (each sides), 15 tummy tucks, 15 bicycles, and 15 vsit crunches X 3 Sets. 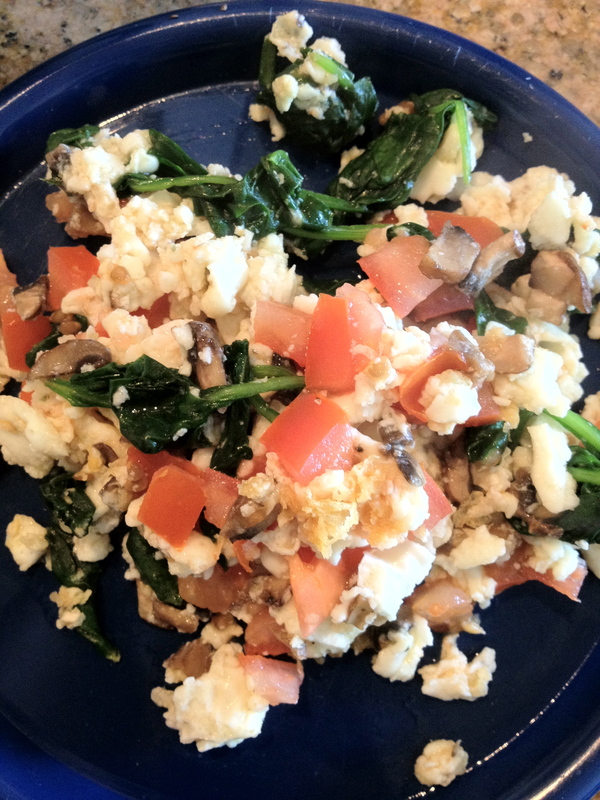 Meal 1: Slim Down Scramble without salt. Meal 1: 1/2 grapefruit with stevia. 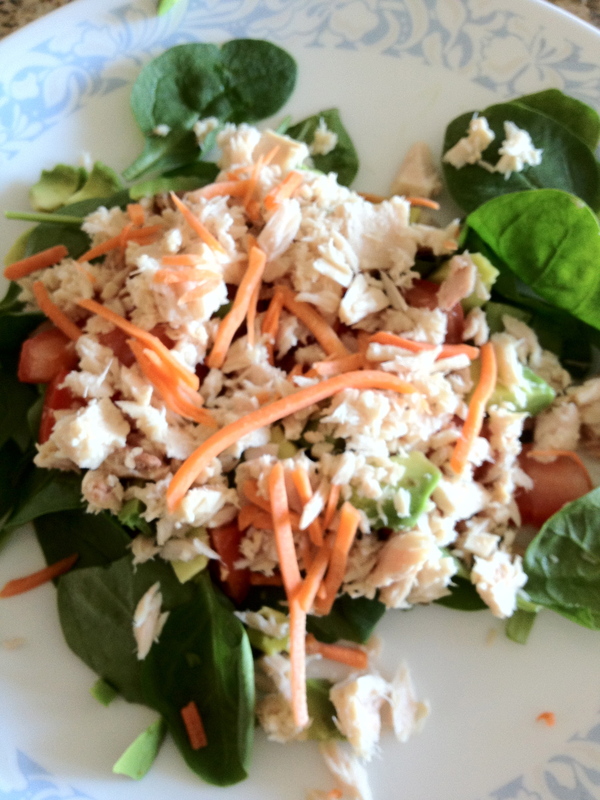 Meal 3: Salad with Spinach, carrots, avocado, and tuna. I ran out of cucumbers and snap peas :-( Need to pick some more up. The tuna was from Trader Joes and had no salt added. Meal 5: Oven baked tilapia seasoned with Mrs. Dash Lemon Pepper. 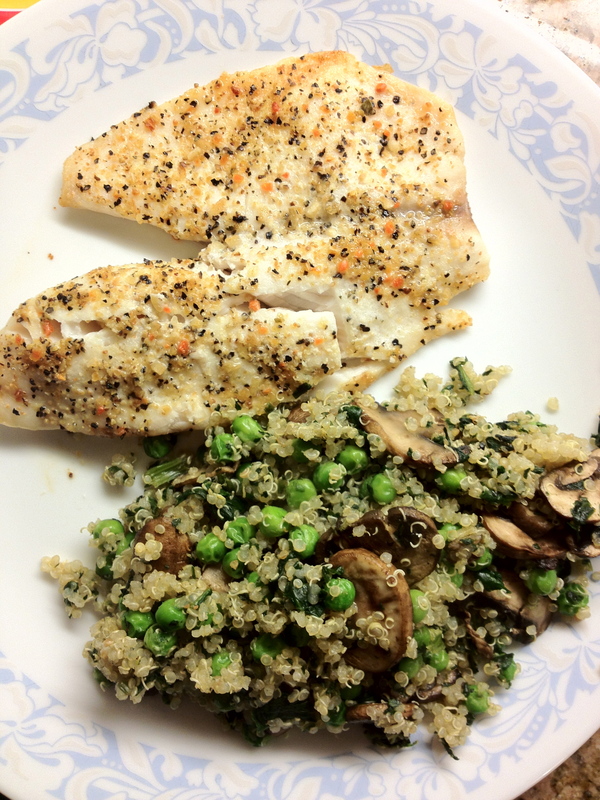 Side of quinoa, spinach, peas, and mushroom mix. Seasoned with Mrs. Dash Garlic Herb. Drank 100 oz. water and 1 Zico. Besides being tired, I felt great. Day 4 was definitely a challenge with fighting temptation and cravings. I was at Seppe’s Halloween party at his preschool and surrounded by candy, chips, pasta, and every possible kind of sugary sweet you can imagine. 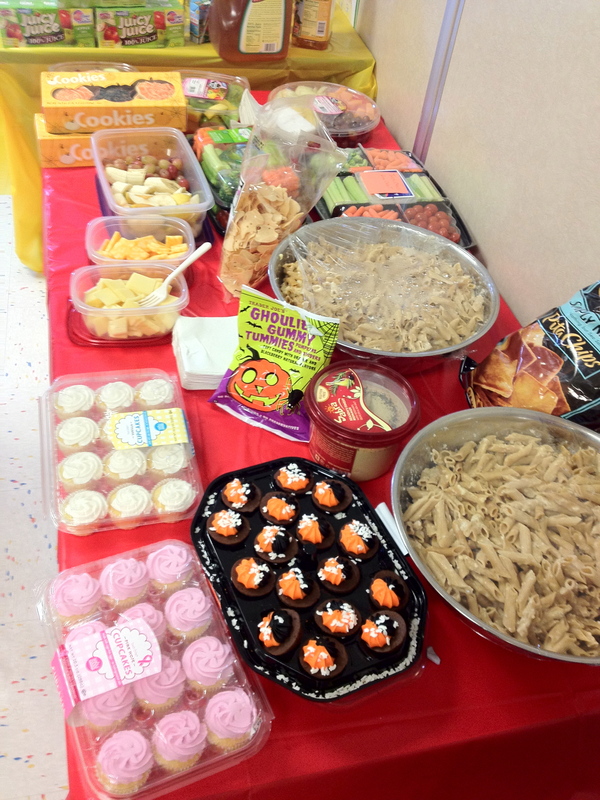 Normally, I would have indulged in at least a couple of my favorites (pudding and cookies). What made it even harder was that it was snack time (Meal 4) while we were there and of course, I don’t have one of my handy Luna or Larabars in my purse :-( Luckily it wasn’t too long of a get together and my boys actually didn’t want to keep stuffing their faces full of sweets (I know surprising!) . It was a bit longer than usual between Meal 3 and 4 but I enjoyed my slim down shake as soon as we got home. And Yes, even though it was my birthday today, I decided to stick to the Slim Down. No cheats :- ) The body I am working hard for is the best present I can give myself. 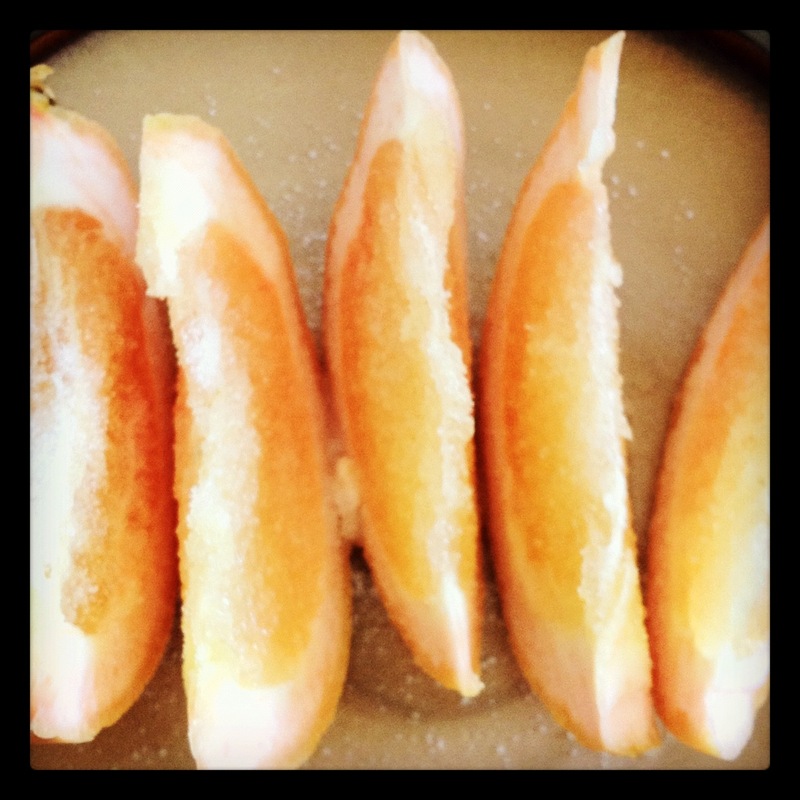 M2: 1/2 grapefruit with Stevia. 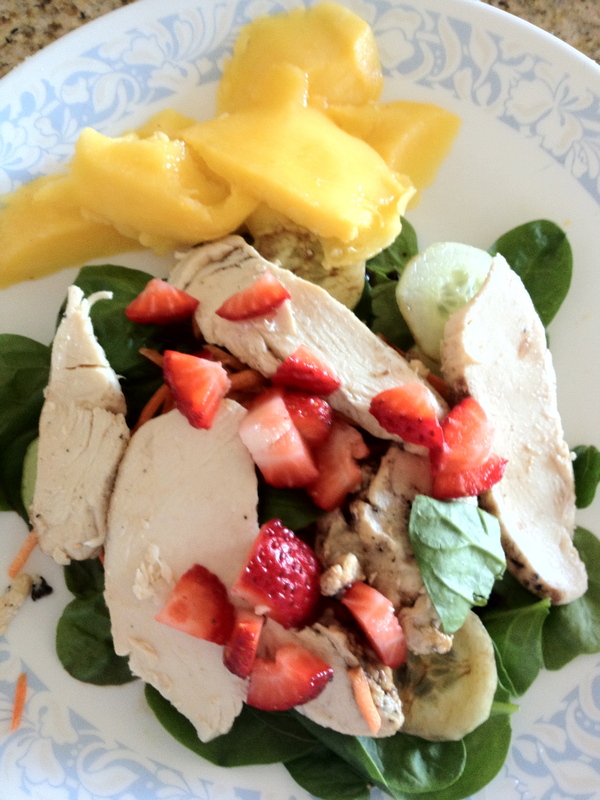 M3: Salad with Spinach, Chicken, cucumbers, carrots, and 1 strawberry. Half a Mango on the side. 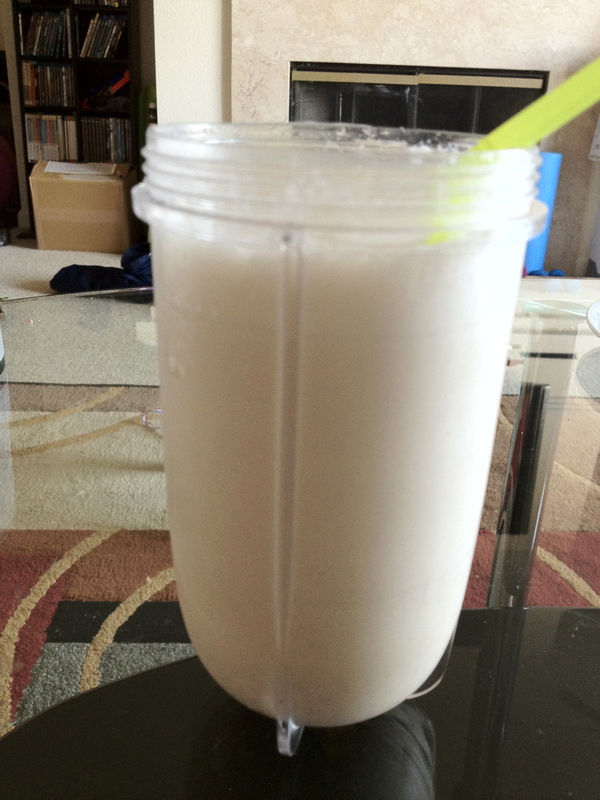 M4: Slim Down Smoothie – so yummy and refreshing. 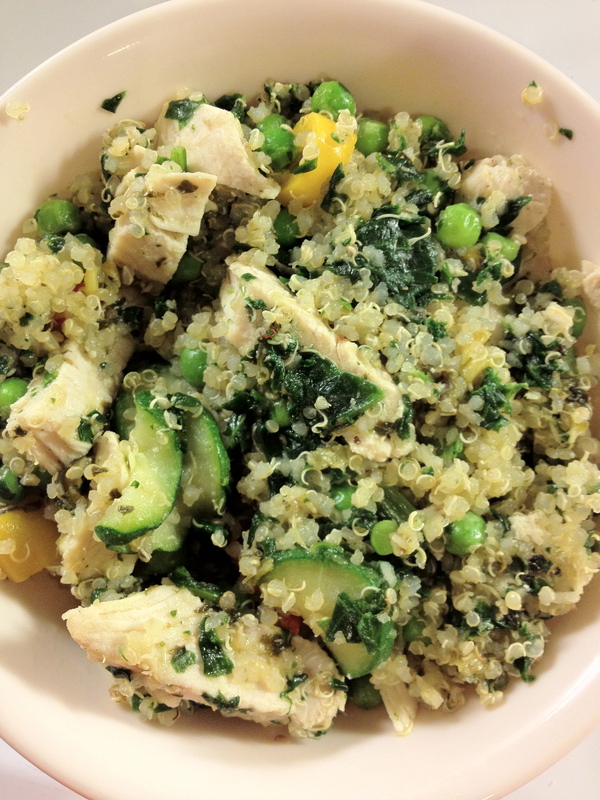 M5: Chicken, Spinach, Peas, bell pepper and Zucchini mixed with quinoa and seasoned with sea salt. Just had a little bit of quinoa left and I needed to finish it. I like to put my quinoa mixes in a bowl. I consider today a big success :-) Only 3 days left! Day 3 Done! Today went great. I was worried that I wouldn’t be able to get up for my bootycall because my 4yr. old crawled in bed with us last night. I was so tired that I didn’t even realize he was in bed with us until before my alarm went off. He had taken the blankets and I woke up because I was cold. I got up when the alarm went off and got dressed. Drank some water and headed out for a run as soon as it was light enough outside. My run went great. Did 3 miles at my usual pace. It’s definitely getting colder out. Going to need some running gloves soon. My original plan was to do the Shredmill for my second cardio session but I’ve been really wanting to try out TIU’s new workouts so I did the Ghost Buster Cardio at the gym. OMG! That was a workout!! The 2 minute sprint interval was killer. Did the spooky workout when I got home. The Black Widow was really tough for me but I got through it. 20 reps each for 3 sets. I planned on doing One Day Fat Blast workout 1 and almost skipped it since I did the Spooky workout, but I didn’t :-) I ended my night with NTC Ab Burner workout. Yes I am tired! But I feel great. 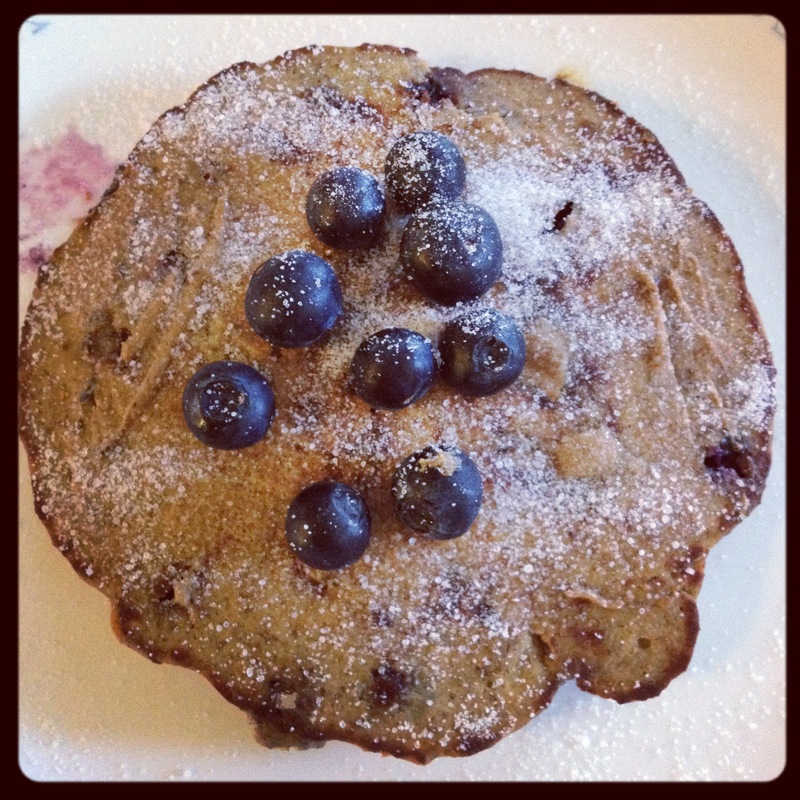 M1: Slim Down Protein Pancake – This one came out bigger and a little messier but it still tasted good. 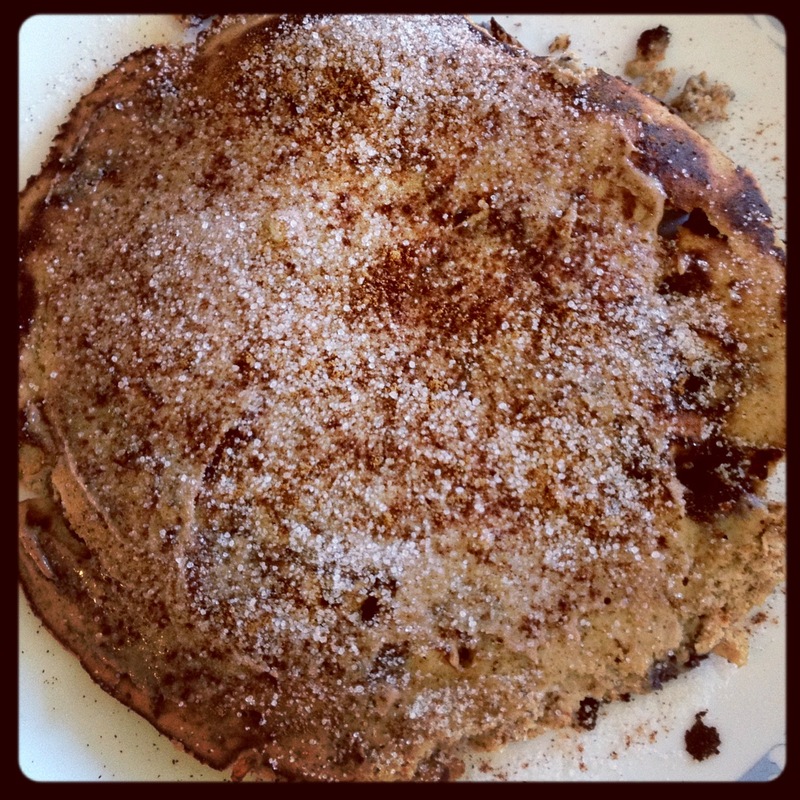 I topped it with a little almond butter, truvia, and cinnamon. M2: Half an Grapefruit with Stevia. Again, shared with my son. He loves grapefruit. 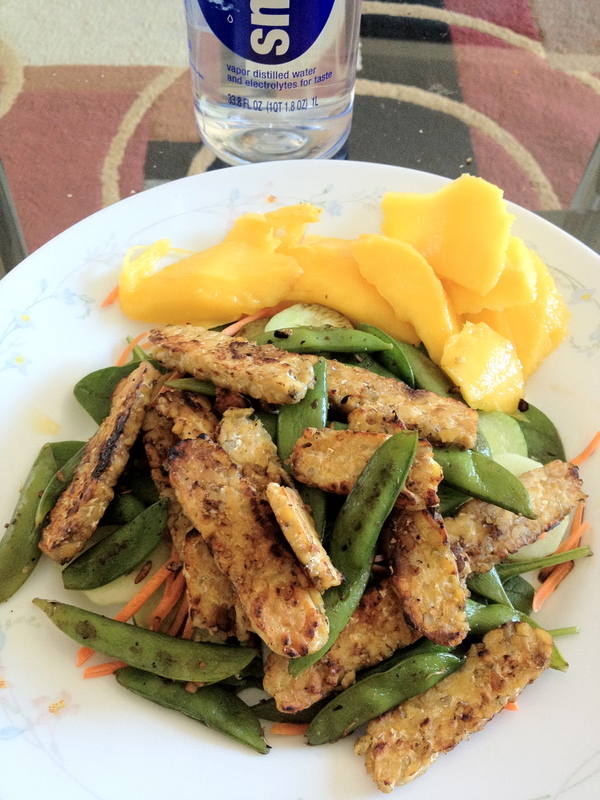 M3: Salad with tempeh, spinach, cucumbers, snap peas, and carrots. Balsamic Vinegar dressing. Mango on the side. I love Mangos and I could eat it every day :-) I didn’t finish it all. It was very filling. 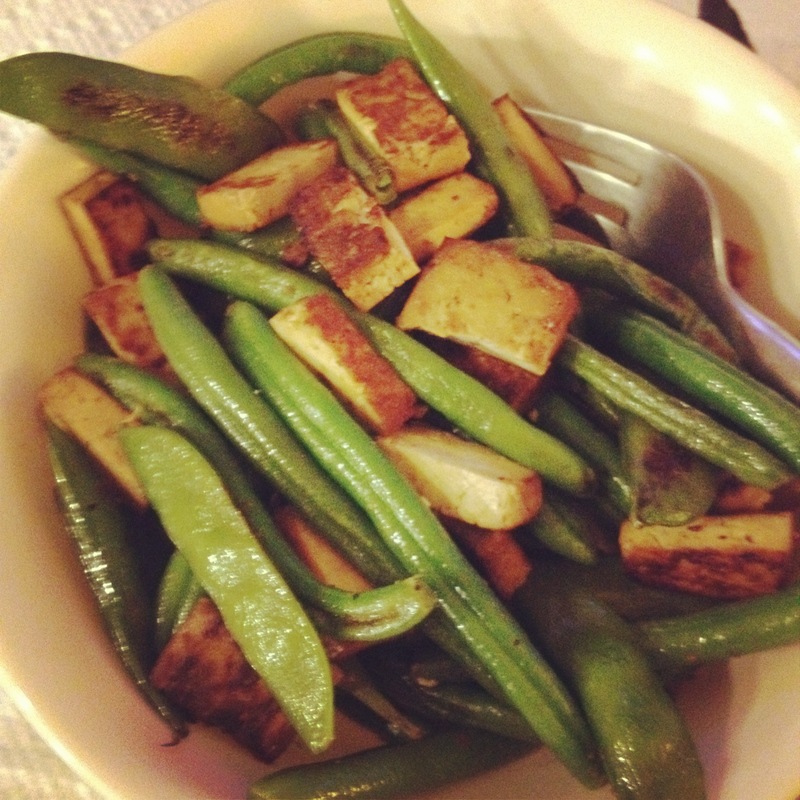 Tempeh Salad with Cucumbers, Snap peas, and carrots. Mango on the side. M4: Veggies and Hummus. Celery and cucumbers with Eggplant Hummus. I would have had some carrots too but I foot I had them in the fridge. I wasn’t really hungry during this time either so I didn’t have a lot. 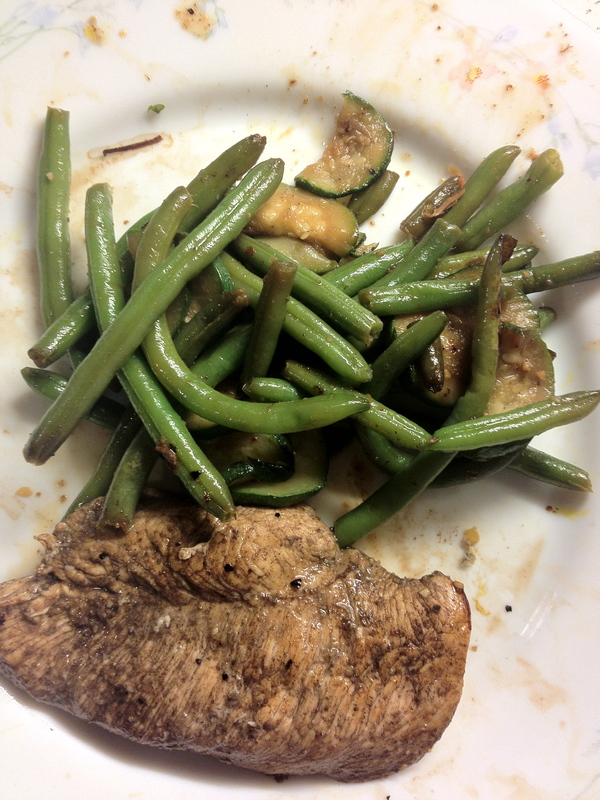 M5: Chicken Breast with green beans and zucchini. I marinated the chicken in balsamic vinegar and olive oil. Seasoned it with sea salt and mrs. dash garlic herb seasoning. 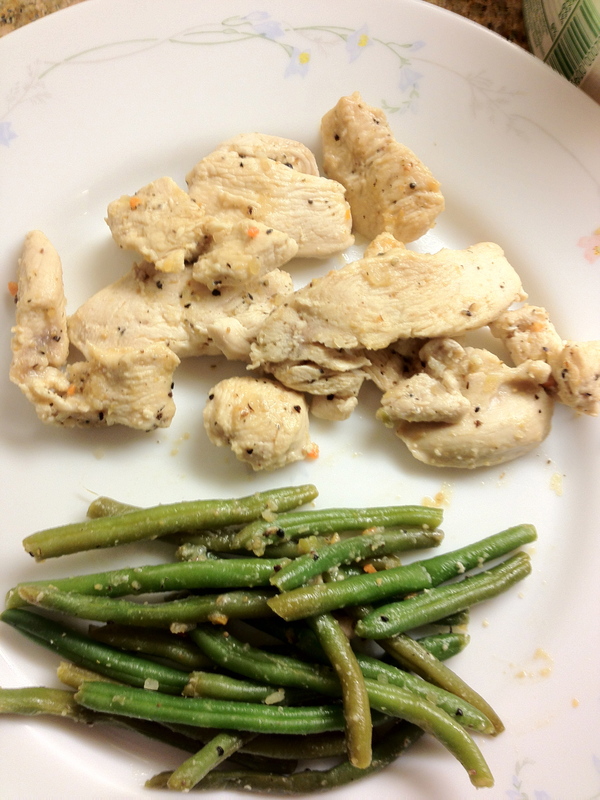 Chicken, Green Beans, and zucchini. I’m feeling great and on track with all my goals. Another 110 oz. of water :-) And a Zico. That Zico was a great pick me up :-) So bring on Day 4! 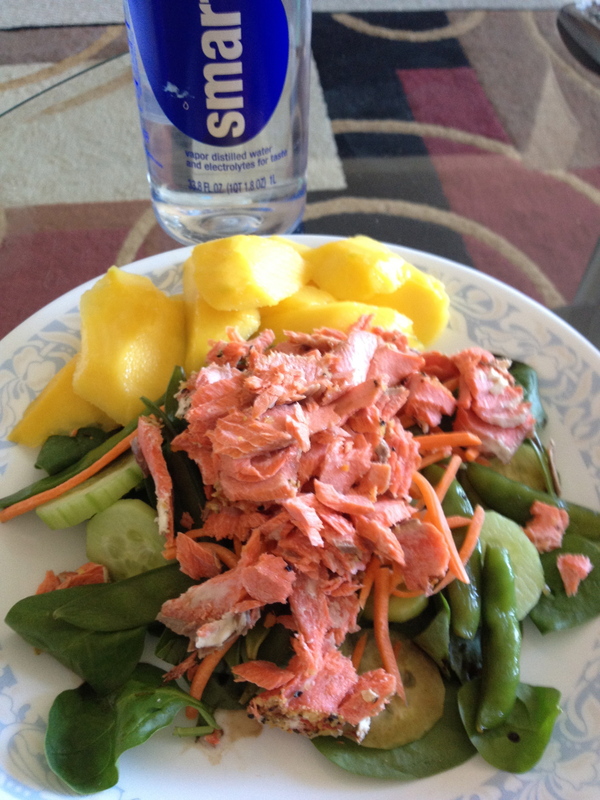 M3: Salad with Salmon, spinach, cucumbers, snap peas, and carrots. Balsamic Vinegar for dressing and half of a mango on the side (shared the other half with my son again). 3 Mile run – Didn’t go as fast as I usually go. I think I was tired from yesterday’s workouts. I still felt pretty good during the run though. 30 min HIIT workout on the bike at the gym for my second cardio session. Hump Day is when I like to work on my booty and along with TIU’s 200 bootylifter challenge for today, my booty got worked! 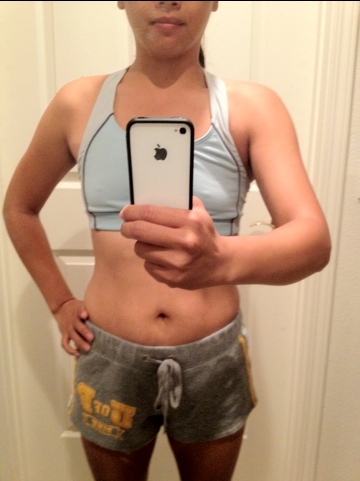 I did TIU’s One Day Fat Blast workout 2 – focusing on abs and booty. I ended with Pop Pilates Hot Abs and Cinch That Waist X 3 sets. I switched off between the two – I did one workout then the next and that was a set. Drank 110 oz. of water today :-) I’m really happy that I’m keeping up with my goals that I’ve set for myself for the slim down. Having these goals helps keep me focused. *Drink 100 oz. of water every day. *Run at least 3 miles every day. *Do 2 Ab workouts every day. Today was Day 1 of the 7 Day Slim Down for me :-) This is my second time doing it. I am hopeful that I will get great results again. I’m not sure if I will lose 6lbs again though. I was heavier the last time I did it so I had more to lose. But I plan on kicking up my workouts this time around so we’ll see how it goes. It’s going to be a crazy week for me. I have lots to do to prepare for my trip to Vegas. I hope I’ll be able to juggle everything.